I did this walk on 29th May, just two days after my last walk rather wet walk along the Hertfordshire Way. I drove up from Walthamstow and parked in the village of Great Gaddesden just 0.14 of a mile away from where I had finished the last stage. Leaving Great Gaddesden the Hertfordshire Way crosses three small fields as it heads uphill to reach a road where the route turns right along the road which is running along the top of a hill ridge, despite searching I have been unable to find out what this road is called. After a short while the road becomes a farm track, photo 2, which is followed until a house is reached on the right and the Hertfordshire Way takes footpath off to the left besides a small pond heading over a very large open field, photo 3, as the route heads towards Little Gaddesden. The route heads downhill, then uphill over the large field and through a kissing gate into another smaller field. Reaching a road the Hertfordshire Way heads straight across into the small cul de sac of Cromer Close and continues along a footpath between houses at the end. At the end of a garden the route turns right along another short footpath off to the right which leads to a small playing area, photo 4. Crossing this the Hertfordshire Way enters into the woodland of the Ashfield Estate. Here the route makes its way downhill through the trees. Leaving the trees the route turns right along a driveway which also forms part of the Ashridge Estate boundary trail, photo 5. However the Hertfordshire Way soon bears left along a path that runs uphill into the trees and passes in front of the large Ashridge House, now a training college, photo 6. The route then makes its way round to cross a fairway before heading down Princes Drive, photo 7, towards the Bridgewater Monument, some 1 ¼ miles ahead. 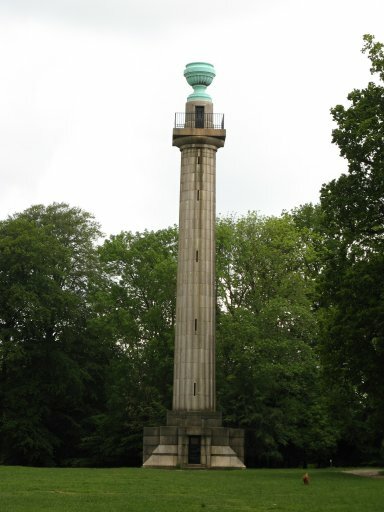 The Monument was erected in 1832 in honour of Francis Egerton, the 3rd Duke of Bridgewater and his pioneering work on British canals and stands 108 feet tall. The route initially follows a grassy path along Princes Drive but after crossing the road the Hertfordshire Way makes its way along a tarmac driveway to the monument, photo 8. Here the route follows the drive round to the left passing a tea hut before heading downhill on a gravel track running between trees, photo 9. The route is once again following the Ashridge Estate Boundary Trail and also links up with the Icknield Way for a short distance. As I was walking this stretch of path there was a heavy downpour but fortunately it was only very short lived and the trees protected me from the worst of the rain. A few minutes later the sun was back out again. Reaching a road, Toms Hill Lane, the route turns right and passes through the village of Aldbury, photo 10, heading round past the church to take a footpath that runs off to the right. Aldbury is a very attractive village and well worth exploring. The footpath leaving the village was also signposted to the Ridgeway 0.6 mile. The path heads past the side of some farm buildings and onto a footpath that runs gently uphill beside a field. There were fine views off to the left over gently rolling farmland, photo 11. Reaching a junction of paths the Hertfordshire Way turns left along a narrow hedge lined bridleway which after the recent rain was very muddy. This starts heading down hill with a golf course to the right as it makes its way towards Tring Station. Reaching another bridleway that crosses the path the Hertfordshire Way links up with the route of the Ridgeway National trail, photo 12, for a short distance as it makes its way down over a field to a road. Reaching the road it is just 0.2 of a mile to Tring station, photo 13, the western most point of the Hertfordshire Way and the end of stage six of the walk as detailed in the Hertfordshire Way guidebook. After visiting the station I turned round and retraced my steps for a short distance before taking a footpath off to the left that ran alongside a large grassy meadow, photo 14. Crossing a gallop the Hertfordshire Way takes a hedge lined grassy track that leads up to a road. The route heads straight across to start heading uphill along a driveway. This soon becomes a tree lined sunken path that heads steadily uphill through the trees. Reaching a road the path crosses the Chiltern Way and continues ahead through a rather more level patch of woodland, once again inside the grounds of the Ashridge Estate. The route follows a path that runs round quite close to the edge of the forest for some distance before turning to the left. After all the recent rain the routes through the wood were very damp and muddy with a lot of standing water on the ground, photo 15. Reaching a road the Hertfordshire Way turns right for a short distance before heading across another road at a T junction and heading back into the woodland. Ahead of me I could see some deer grazing on the path although they soon melted into the trees as I approached. The path then continues on along forest paths for some considerable distance. Reaching Little Coldharbour Farm the Hertfordshire Way the route bears left onto a gravel driveway. On the track I met a woman walking her dog who told me she had just spotted a Cuckoo, a bird I have only ever seen once while out walking. Where this track turns to the left the route continues ahead once again on forest paths, photo 16. The route is also back following the Ashridge Estate Boundary Trail once again, a walk I will definitely have to do at some point. Eventually the path enters into Berkhamstead Golf course, photo 17, although the route remains on a wooded tree lined track. Reaching a road the route heads straight across on another similar path. The day had started bright with scattered clouds overhead, some of which were grey and rainy. Entering this section of path the skies really darkened over and there was another downpour. This one was a bit more sustained than the previous shower and I had to stop and put my waterproof coat on. As I made my way down besides another fairway there was a really heavy hail shower which left the ground, particularly the short grass of the golf greens, covered in white. A short distance further on I reached the road at Potton End where I finished my walk along the Hertfordshire Way. At this point I had done 9.82 miles so that was 9.68 Hertfordshire Way miles for the day. It was then time to head back to the car. I took a hedge lined path that heads off to the left that crosses a road and then heads along a tree lined track that goes downhill through woodland to reach a road by a pub in the hamlet of Frithsden. In the road there was a drain cover which had water shooting out at each corner after the recent downpour, photo 19. Crossing the road the route heads quite steeply up a road that runs opposite, passing the Frithsden Vineyard. Heading uphill this road becomes more of a track and reaching the top of a hill, photo 20, I took a footpath that runs to the left just inside the field edge that then headed steeply back downhill through a grassy field to reach the small village of Nettleden. Crossing the road I headed up a footpath signposted St Margarets ½ mile. This runs quite steeply uphill again between trees and a field edge, photo 21, gradually making its way up to the crest of the hill above Great Gaddesden. After passing through a small patch of trees this reaches a road besides the Amaravati Buddhist Monastery. On my way up the hill I had passed a brown robed monk heading towards Nettleden which was a rather incongruous sight in the Hertfordshire Countryside. From the monastery it was then just a few yards along the road to the footpath I taken up from Great Gaddesden at the start of the walk. Reaching the car I had walked 11.8 miles for the day. This had been one of the more enjoyable sections of the Hertfordshire Way to walk with varied walking and plenty too see and I will definitely be exploring this area more in the future.